You already know about the Arcade – it's Memphis' oldest cafe, it was in "Mystery Train", they've been on the Food Network a bajillion times, and they've got really great sweet potato pancakes. But have you ever noticed that some of the tables have names? Assignment #130 in the 365 Things to Do in Memphis to eat lunch at one of the Arcade's named tables. Since the restaurant opened in 1919, it's seen its share of regular customers. 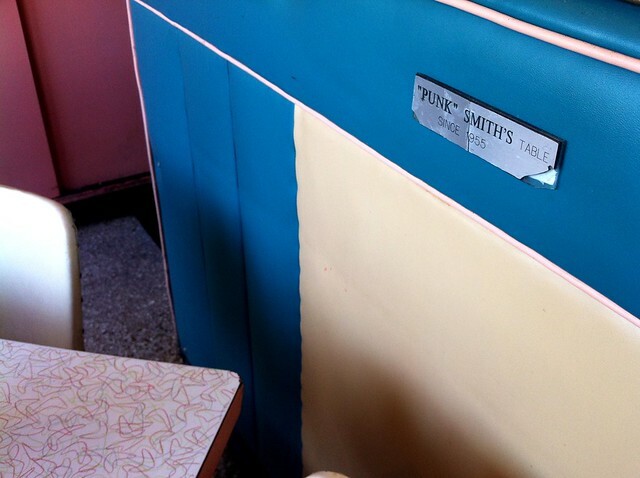 A few of them have tables and vinyl booths named after them – "Punk" Smith, Mr. Kennedy, the Elvis Table. I don't know who Punk Smith is (maybe he was one of the guys who hung out there when the Arcade hosted rock'n'roll shows), but he's got one of the best seats in the house – a four top in the back of the restaurant. Sit at the named table of your choice, order Eggs Redneck, sweet potato pancakes or the classic "Pert Sandwich" and feel like a regular. "Punk smith is the owner of the hardware store next door. He comes in ever morning for breakfast. Punk Smith was a wholesale jobber that worked out of the adjoining building. A colorful character a former carnie. I know this because my father was a good friend and I grew up eating lunch at this table with punk and my father.